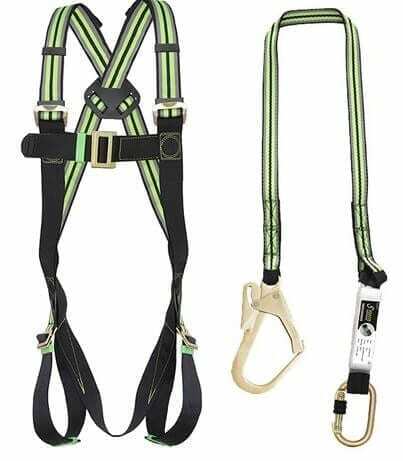 Our fully-featured single point scaffolding harness kit comes with a universal harness, a webbing lanyard and a carry sack to keep everything you need together. It is just one of our height safety products that will help individuals work securely on scaffold assemblies. The first component that is included in this kit is a single point harness, which offers lots of adjustable straps and restraints so that it can fit almost anyone, no matter their size or shape. It also has colour coding so that you can tell the difference between the shoulder and thigh straps, to avoid confusion. Next up is the webbing lanyard, which boasts a length of 1.8 metres and has shock absorbing qualities that will prevent sudden jolts from jarring you or your equipment while you are out on the scaffolding. The lanyard is endowed with a sturdy hook, as well as benefitting from protective webbing which is placed around the loops to minimise wear and tear as time passes. Remember to choose the right height safety kit for the job at hand, taking into account the work you will be doing, the features you require and the levels of security you want to achieve. We offer 2 point and 3 point for added peace of mind. Height safety should be taken seriously, but with so many products available you might not know which to pick. Our team can help you out, with advice and quotes available when you call 01384 78004 or send an email to Rope Services Direct through our contact form. Single Point Scaffolding Harness Kit Overall rating: 5 out of 5 based on 6 reviews.